Happy Halloween! I’ve gotten a few comments recently on my Halloween 2005 which reminded me of the reader requests for costume updates. This year I decided to once again utilize some of my travel souvenirs for my Halloween costume. One of the things that I most enjoy when traveling is observing the local costume, so I never thought twice of honoring the Akha Tribe of Easter Myanmar with my Halloween costume. 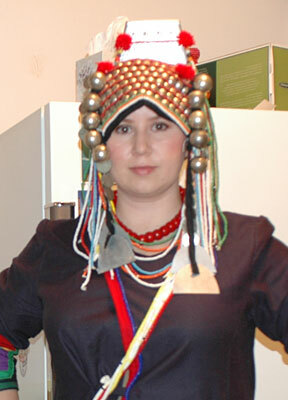 I can understand how it might come across as strange, maybe even insulting to dress up like a different culture. In America Halloween no longer requires a scary costume, in fact few people dress up scary anymore. When I lived in England in the 90’s most locals who celebrated Halloween (and there were few back then) thought a costume was supposed to be scary. 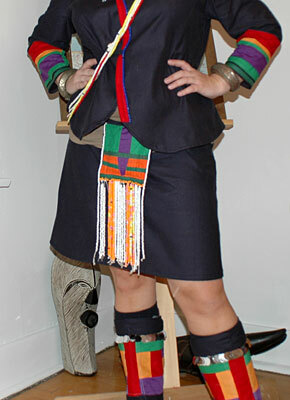 What do you think about dressing up in another culture’s traditional costume? It might be strange, maybe even insulting, to dress up as a Japanese person, but I wouldn’t think twice about dressing in a Kimono as a geisha. There’s a new poll to the right to chime in with your opinion. The two photos I have of my costume are not amazing this year. Last Saturday night I was running out the door and quickly trying to find a good place to use my self timer which is why neither photo has my entire costume. On the way to the party I stopped at a liquor store to buy beer and was carded while wearing my costume, including my headdress. The owner asked if I was wearing my grandma’s clothes, which I found especially odd. If you’re interested in other Halloween posts you can read about Halloween 2007, Halloween 2006 at Everest base camp (my costume was someone who likes hiking), Halloween 2005 in Chicago, or Halloween 2004 in the Xishuangbanna region of Western China (where I dressed up as a Canadian). While looking for some files the other day I stumbled upon fifteen videos from Myanmar (Burma) that I neglected to upload to Vimeo with the last batch. Visit my Vimeo page directly and look a the “newest” videos to see them all. Sweeping the Shwedagon from Megan Kearney on Vimeo. Now that everyone has had time to look at my Phase II videos I’ve added Phase I. The majority of these videos are from Myanmar, although I do have a fondness for the one video I took in Thailand. Possibly my favorite video from both of my trips is this mob scene when I was trying to photograph children playing in a nondescript Mandalay alley. Not to disappoint people who like videos of driving there’s not one, not two, but three videos from the back of taxi speeding through Monywa, Myanmar. Finally, those interested in traditional culture can catch a glimpse of four dances performed at a Shan celebration at Inle Lake. Silk Loom from Megan Kearney on Vimeo. Another entry from Myanmar is up. Read about my adventure getting to the golden rock at Kyaiktiyo here. The third Yangon post is up… check it out here. The next post will be about The Golden Rock! A second Myanmar post is up! This one is about my time at The Shwedagon Paya, Myanmar’s most important Buddhist temple. Check it out here. 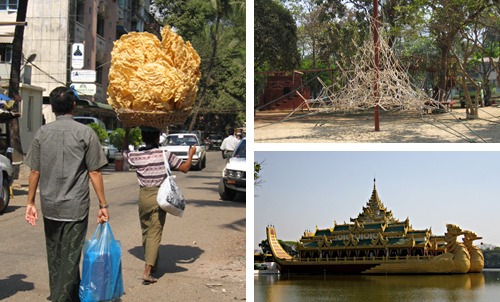 My first post about Yangon is up! Because I post-dated the entry it won’t show up on the first page here. To find it you can search, look by date (February), by country or just follow this link. This post has a few little videos. Enjoy! The government of Myanmar (Burma) moved the capital of the country from Yangon (Rangoon) to Pyinmana, 200 miles North. Some speculate that the move was suggested by an astrologer (this is not uncommon in Myanmar) and others say the move was to make the country less vulnerable to possible attack by sea from U.S. forces. This is a very interesting development and I am curious to see how things develop. Will Mandalay open up to more international flights? Will foreigners be allowed into the new capital? If someone needs to extend a visa how will he get into Pyinmana and will there be hotels? Right now it sounds as if personnel were moved overnight and were not permitted to take their families, where does that leave tourists? And last of all, what will happen to the democratic activist and Nobel Prize winner Aung San Suu Kyi, who is still being held under house arrest in Yangon? I had to see it. The gold leaf-covered rock balancing on a mountaintop Southeast of Yangon attracts pilgrims and tourists alike. It would be much more popular with tourists if it wasn’t so painful to get to. Even the most luxurious traveler with a private car will only get as far as the mountain’s base in comfort. A grueling one hour ride in the back of a dump truck gets everyone halfway up the mountain and only the truly rich, old and unashamed pay to be carried–yes, carried– the rest of the way up. My journey started early in the morning with a ticket purchased from my hotel and a one hour taxi ride out of Yangon to the bus station. Touts at the station were disappointed to see I already had a ticket and pointed me to the garage where company men were selling tickets to locals. I had left Yangon by taxi in the dark, but by the time the bus pulled away from the station around 8am everything had woken up. Buses in Myanmar are quite comical with large wheels set on even higher suspensions, a bit like a poor version of the cars you used to see on rap videos. Unfortunately, the bumps and shakes on these buses aren’t fashionably intentional and are most often a result of dirt roads and potholes. Along the way we passed by many towns and I watched locals buy an sell goods, monks collect alms and animals chase each other across the street. After five hours on the bus from Yangon I arrived in Kyaiktiyo where I took a smaller bus to the base of the mountain. Of course, I had no idea how many buses to take or when to change buses but I decided to go with the flow when all of the locals got off the bus and onto the smaller bus. In fact, because I took my time getting off the first bus I barely fit onto the second, smaller open-back bus. I sat on the edge of the back opening, held on to the metal bars and hoped that the trip wouldn’t take long. We stopped after a short time and I was pushed into a group of touts promoting their hotels. I had left my big backpack in Yangon because I wanted to stay at the top of the mountain so I was able to outmaneuver the men and sneak to the platform where a large dump truck was loading passengers. The platform was designed so that trucks could be loaded on either side of the 12′ high wooden structure. I was one of the first 10 people onboard and knew that we would take some time to fill up. The back of the truck had narrow wooden boards laid across the back to form benches. The space between each board was approximately 6 inches–not enough room for my short legs to bend correctly, and not enough for the local pilgrims either. To add insult to injury another dump truck pulled up, loaded passengers and left us behind. The main attraction in Yangon is the Shwedagon Paya, but my favorite thing to do in any city is walk around, get lost and watch everyday people doing everyday things. The day after The Shwedagon I decided to head out to another paya described in the Lonely Planet guidebook as having a “mirrored maze”–sounded right up my alley. On the way to the mirror-maze paya I headed East and soon found myself walking along with about one hundred other people on their way somewhere. At one point all of the traffic stopped and wrapped along side streets. I was curious what could be blocking our way–an accident, a market? It was none other than the U.S. embassy! Housed in a British colonial style building, the embassy appeared to take up most of the block, but the real problem was the cement barricades covered in rolls of barb wire blocking off the entire street and sidewalk in front of the embassy. After stopping in front to laugh a bit I walked around the entire block and spotted the tiny Australian embassy behind one door which opened up to the sidewalk, no barbed wire in sight. I had decided that in addition to visiting the mirror paya I wanted to head up north to a paya with a long, reclining Buddha. Away from the city center the streets widened and the buildings were scattered with more contemporary, usually unattractive, buildings. I wandered into a a neighborhood with an interesting paya. The stupa was quite plain, but covered in birds. Around the perimeter was a diverse group of statues and paintings. I dropped a donation into the glass boxes covered in Burmese script and headed back onto the street. Soon I spied The Shwedagon from quite a distance and realized I was near Kandawgi Lake. I was determined to get to the lake and navigated the wide road circling the fenced off park. As soon as I walked in I was greeted by a military officer asking for the entrance fee. I couldn’t believe there was an entrance fee to a lake, but I had made such an effort to get there I decided to pay the 1,000 kyat fee (a little over $1) to get past the guard. I was a bit moody and crumpled the ticket up in front of the guard and generally looked angry, even though I know from experience that anger is counterproductive in Asia. Unfortunately, there wasn’t much to see in the park. It was obviously for more wealthy locals, with playground equipment and small stands selling popsicles and drinks. Before heading out of town I had to stop at my favorite shop in Yangon–the ice cream shop! I was still one month out of the hot season but 90° heat was hot enough to warrant ice cream. The stand was on one of the major streets in town, in-between my hotel and the internet cafe. A girl served me the best mint chocolate chip ice cream I have ever head–in a waffle cone to boot! Looking back, I’m sure it wasn’t very good ice cream, but when it’s so humid that you are soaking wet all day long anything cold tastes glorious. Besides, 250 kyat (30 cents) is a small price to pay to cool down and prepare for my trip south to the golden rock, where I wasn’t sure I’d find any food at all. You can see the photos from Yangon in the gallery.